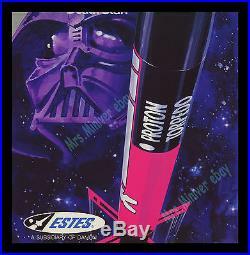 Here's a piece that represents the best of store display advertising movie posters: A 1977 Star Wars ESTES Proton Torpedo MODEL ROCKETRY Poster! This poster was made for display at the model shops. It's as nice a design as any of the theatrical posters and has a profound connection with the film, as all the models in the film were built from kits found at these very shops. Estes was one of the only companies that had toy product ready for sale in 1977 - when the film hit big, and so it's one of the earliest posters made on Star Wars. The "Proton Torpedo" kit advertised on this poster couldn't be a more appropriate match for the budding franchise. This poster was designed to hang in the shop, most probably on the door for all the eager patrons to see. It's one of my personal favorites, and I have over 3000 different Star Wars posters! It's also one of the RAREST! In almost 40 years of collecting Star Wars posters I've only seen two! This poster was issued approximately 27x9.5 inches. WITH the paper mount it's. Approximately 29.5x11.5 inches. It was designed and printed WITHOUT a white border. They call that a full "Bleed" in the advertising industry. It makes it much harder to handle a poster if it's a full Bleed, and so I had the poster museum linen-mounted to smooth-out all the two hairline folds it was made with. The poster came to the store folded inside the case with the kits. This poster was NEVER displayed. It's been carefully stored away since 1977. It's in SOLID MINT/NearMINT condition! It was that way before I had it backed. I used the best conservator in the USA to back this beauty. He ONLY uses high-grade materials, such fine acid-free Japanese rice paper. The better materials cost more but make a real difference in the end result. It's flat as a pancake and as clean as can be. It's quite an eye catching display. If you own one of these vintage Star Wars kits this poster is a MUST! Is an accepted form of poster preservation by the Library of Congress and every Museum in the country. A lot of advanced poster buyers request and prefer mounted posters because it makes framing and displaying the posters much easier - ESPECIALLY on borderless posters. As I pointed out, this poster was made without a border. The nice light beige margin you see in the photo is Japanese paper the poster is mounted on. You can see how easy it would be to damage the original poster without that extra margin of protection. The backing makes the poster much safer to handle - it GREATLY reduces the risk of damaging the original. Also, all of my linen-backed posters have been stored FLAT so they DO NOT have a curl to them - They're ready for framing and display! If you are looking for an investment/museum quality poster, look no further. If you're looking for an investment/museum quality poster, look no further. Keep in mind , right NOW the sequel to Return of the Jedi: "Star Wars: Episode VII - The Force Awakens" is still happening! This film has caused quite the buzz around the globe. Hollywood hasn't seen anything like it since the original Star Wars hit back in 1977. Disney also has announced that it will be releasing another big-screen MAJOR motion picture feature on Star Wars every year henceforth - in the cinemas! That's unprecedented for any movie franchise. This December, the new DARTH VADER picture, Star Wars. That should be awesome to see the man in black back again. If that's not enough, additionally, they're constructing the TWO (2) world record largest theme parks ever built, and both are going to be 100% dedicated to Star Wars! When that happens, this poster will inevitably be a HOT PROPERTY. Let's face it, it's red hot now, but it will undoubtedly become a white-hot mamma when we round that bend. So pick it up now while it's still obtainable. Ben Obi-Wan Kenobi Anthony Daniels.... It can crash regardless of any decision you make and can even crash regardless of any decision made by the company related to the stock - Leaving you with a near worthless piece of paper that won't inspire anyone! The magnificence of art and historic documents have an inherent value that relates to civilization and society. This poster is definitely ECONOMY PROOF! Please write with any questions, and if you are in the market for top quality original vintage movie posters or Star Wars, then please. 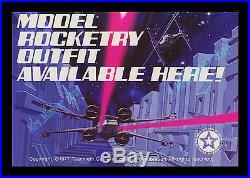 The item "MINT 1977 Star Wars ESTES Proton Torpedo MODEL ROCKET Store Display MOVIE POSTER" is in sale since Monday, April 11, 2016. This item is in the category "Entertainment Memorabilia\Movie Memorabilia\Posters\Originals-United States\1970-79".miniver" and is located in Studio City, California. This item can be shipped worldwide.